Calling all college rugby players! Come to Sevilla for a Spring, Summer or Fall term to study the Spanish language and culture whilst also playing competitive rugby! At SAIIE, we have cooperated with two well-renowned local rugby clubs ¨Ciencias Club de Rugby¨ and “UAS” to offer an academic-athletic program where competitive College rugby players (male and female) have the opportunity to study with us and train with the team whilst still earning college credits. The ¨Ciencias Club de Rugby¨ club has been a source of talented players, many of whom have played for the Spanish National Team. Between 1992 and 1996, the Club won two National League titles in “La División de Honor”, three “Copas de S.M. el Rey” titles, and the “Copa Ibérica” title. In Rugby Sevens they have also won the National Championship. With the Rugby program, students must choose a minimum of 12 credits from our range of academic courses during a regular semester (spring or fall), and during the summer term a minimum of 3-4 credits each session. We offer courses in Spanish language, Spanish culture, Liberal Arts and Business among other areas of study. Alongside their studies, they are also placed in the local Sevillian rugby club, ¨Ciencias¨ or “UAS” for weekly training sessions and various friendly matches throughout the term. When students arrive they must first do tryouts with the team, and depending on their level they will then be placed in either the first or second team. In the spring and fall terms students play Rugby 15 (union rules) and in the summer term Rugby Sevens. Why play rugby in Seville? 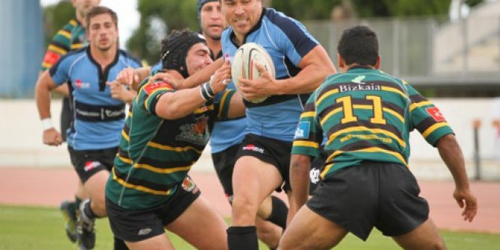 Playing rugby in Seville whilst studying abroad helps you maintain your fitness and game at a high standard. Also by playing on a Spanish team you will be able to practice Spanish on a weekly basis with Spanish natives and make friends. You will also learn another style of training and playing methods and get to play against other Spanish teams to see your level. What type of field will I be training on? For most trainings, you will be playing on artificial turf. However, sometimes you may be training or playing on natural grass. What type of rugby shoes do I need? You will need rugby shoes suitable for artificial turf and natural grass grounds. Trainings will be one in a half to two hours long. How many training sessions take place a week? In the spring and fall terms you will train for 11-12 weeks. In each summer session you will train for 4 weeks, or 6 weeks if you decide to do both summer sessions combined. In the spring and fall terms there is a maximum of 6 American players allowed per team. In summer, a maximum of 3 players per team. The players are between 18 and 30 years old (aprox.). How much money will I need for transportation to and from trainings? Approximately $100 in the spring and fall term and $40 each summer session (aprox.). How far are the training grounds from the school? All training grounds are no further than a 30 minute bus ride away. Will I be able to go see an official professional rugby match? Yes, we will organize to go watch a professional "División de Honor" match (professional Spanish Rugby League) in the spring and fall terms. However, in the summer term this will depend on whether there is a match on during the program dates. Will I play against other Spanish clubs? Am I, as a college student, breaking any NCAA rugby rules or regulations by participating on this program? No, you are not. You will only be training with a local semi-professional Spanish club and playing in friendly matches. The club you will play with does not pay their players to compete.